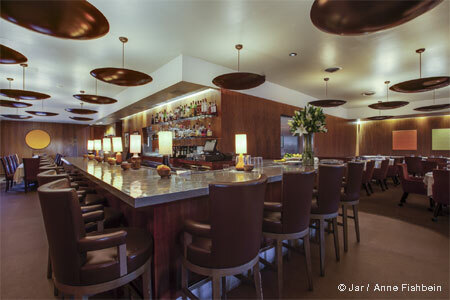 Modern supper club serving Prime steaks and seafood in Beverly Hills. 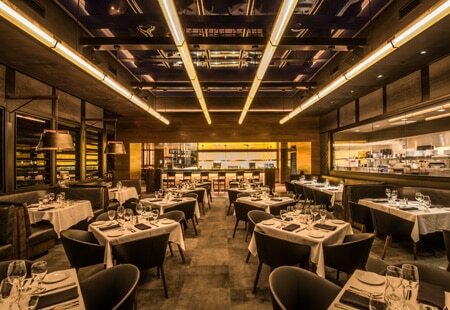 About the restaurant: The Beverly Hills branch of Ocean Prime is the only California location for this nationwide chain that started in Columbus, Ohio. Spanning 11,400 square feet, including a large terrace with umbrellas, the huge space seats 350 guests and presents three private dining rooms. There's also a sushi bar and two bars. Food & Drinks: This modern supper club offers a Continental-style menu highlighting Prime steaks and seafood, including a "smoking" shellfish tower and hand-rolled sushi. Start off with the house salad with goat cheese, apples and sherry mustard vinaigrette, and then continue with steaks such as the 8 oz. filet mignon. Sauces and traditional sides are à la carte. Not in the mood for red meat? The Pitman Farms chicken with spinach bread salad, roasted tomatoes, olives and balsamic jus might fit the bill. For a sweet finale, go for the warm butter cake. Be sure to browse the selection of higher-end wines, saké, cocktails and Scotches. On Sundays, there's a two-course Surf & Turf dinner menu for $60 per person, plus tax and gratuity.